I've been tagged by Funky Doodle Donkey to take part in this meme. 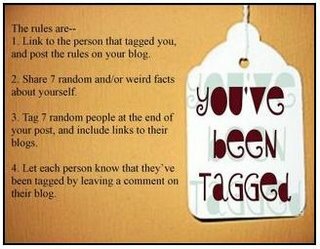 It has taken me about 10 days to respond to the tag, so we shall have to see how I go about writing up weird (as opposed to mundane) facts about myself and I'm still undecided as to whether I will tag other people. [In answer to your next question, yes. I do tend to get very tetchy and cranky when I am studying]. My name is Amanda or Mandy for short. I spent 34 years of my life refusing to let people call me Amanda and then on a whim, decided to start calling myself Amanda when I came to the UK. The biggest reason for this is that I couldn't stand having to spell 'Mandy' all the time. In contrast, I have only had to spell 'Amanda' once in 15 months. My colleagues think this is hilarious and call me 'Mandy' from time to time to see if I will respond. I do, I always do - with a smile. My middle name is Serena and I love that it is spelled the same way as Serena Williams and Serena van der Woodsen from Gossip Girl. My Mum named me after her mother Sarine, as is the Sephardi tradition but she imagined a flowery, dreamy little girl and thus spelled it in the fashion of 'serene'. She got an outrageous tearaway instead but whenever I do one of those numerology-type quizzes, they always depict 'Serena' as a ruthless, ambitious, materialistic person. I used to be very much that type of person. I was a workaholic and I hated Fridays because it signaled the end of my work week. Of course, I soon discovered that I could go into work on Saturdays and Sundays and this made Fridays seem more bearable. I used to speed everywhere too, easily hitting speeds of 80mph on suburban roads. Thankfully, my Dad's lessons of 'you're never in too much of a hurry to make it alive to your destination' began to seep into my life and soon all areas of my life were saturated by that lesson. I work overtime maybe one or two days a month now and that is usually as much a result of me playing on the Internet at work as it is month end commitments and deadlines. I am absolutely mad about music and I have 14,000 songs on my iPod. Stephen once flew me to the UK to see a Pixies concert. Well, the story goes that I received an email from a friend telling me that Pixies were to play a couple of live shows in London. A quick check on the Internet showed that the dates were sold out already - they had sold out on 15 minutes. I went and sat in the lounge and sulked and then I said, "Oh FFS, next they'll tell me that Cranes are playing that week too". Now, Cranes are my Favourite Band in the World Ever. I had lived and breathed every day in the hope that I might one day see Cranes in concert. The only reason I even said something as strange as that was that I knew that it would never happen. Cranes hadn't bought out an albums in ages and they certainly weren't touring. Or so I thought. I walked back to my study and the very next email was from Cranes Fan Forum announcing UK tour dates within one week of the Pixies concert. Stephen must have seen the look on my face then (because no one knows how to have a temper tantrum like a 31-year-old woman). He scuttled off to the computer and came back and said, "if you can get tickets to the show, I will buy your plane ticket". (Yes, I know - we are married and pool finances. But it's the thought that counts). The rest is, as they say, history. My best friend Heather and I got tickets on eBay and we zooted off to London in June 2004 to see Pixies and Cranes. And in 14 days time, I'll be seeing Cranes again in Hoxton. Something else I never thought would happen. Strangely enough, my music is so important to me that I rarely blog about it on my media blog. I just feel frustrated that I can't adequately express my love for music and the bands I like. I have very many interests and certainly like to be in awe of life at every moment. I just like to live with passion. Apart from music, I like everything media related: books, film, television, theatre, comedy and art. I like my husband and my pets. I have lots of friends and tend to stay in touch with people but in the past years I have sought the comfort of my home above socialising and going out. It might be more accurate to say I have become a hermit actually! I'm South African. Well, I was born in South Africa and my family moved to Liverpool, England when I was 18 months old. We stayed in England until I was nine, except for about 9 months spent in Nigeria where my Dad was on contract. Then we moved back to South Africa and I absolutely hated it. At nine years old I had a broad scouse accent and I just didn't get South African kids. I came from a world where we played paper chase through the streets of Rainhill and we stayed out until 8pm or later in summer riding around the neighbourhood or climbing trees in the hospital grounds. South Africa, even in 1982, was an insular world of ten-foot high fences surrounding well to do homes in sprawling, leafy neighbourhoods. Kids didn't play in the street and you visited people's home by invitation and prior arrangement only. People drive everywhere in South Africa and that sense of community where the lady at the sweet shop knows your name was gone. In 25 years in South Africa the one thing I never, ever got used to was searing heat on Christmas Day. I moved back to England on 03 July 2007. I was very, very happy at the cold Christmas last year and I loved the bright lights that I have come to associate with that time of year. I love that it is dark when I walk to work in the mornings and that it is dark again in the evenings. Winter I can deal with - if I have a good coat and ear-warmers. A rainy half-excuse for a summer is less appealing to me. I feel like I have come home, I really do. I feel alive for the first time in years and for a long time I had nothing but nightmares to remind me of South Africa. This is the reason I started this blog because whilst I feel at home, I still feel like an immigrant or a tourist. And I want to remember the wonderful sights that I see in this place. In the future, we might move somewhere warm like Australia or Dubai. Or, I might give into Stephen's desires and get a house within walking distance of Old Trafford Stadium in Manchester. But for now I am happy to be in London and I am aware every single day that I live and work in this wonderful city. Emm, facinating! I loved reading these seven facts about you. I agree that Serena is a beautiful name :-) And hmmm. I'll have to think of 7 facts about myself that I'm willing to share--hahah! Rainhill! My first son was born in Whiston Hospital, and up until shortly before he was born we lived in Rainhill. He would be roughly your age, and by the time you were playing there, we were long gone. Cafe Emm lies in the heart of Soho just off Old Compton Street between Greek and Dean Street. Cafe Emm is a family run restaurant located in the heart of Soho. At Cafe Emm their aim is to provide good Home Cooked food in a relaxed and informal atmosphere. Their menu consists of a variety of British and international foods at reasonable prices. @ JAPRA: Yes - it is a bit daunting thinking of 7 things that you are comfortable sharing out there on the WWW. There is a fine line that we need to consider in keeping our integrity and privacy intact on the Internet. @ Sheila: Amazing! My brother was bornin Whiston Hospital too - in 1978. My Dad lives across the road from the hospital now, so I often get to see it. Which countries have you lived in then? @ BrukeWilliams: That is so cool. I am definitely going to have to drag all of my friends over there for a snack now. I can't believe I have never noticed it before - I am no stranger to Soho (having spent a winter there in my uncle's flat over the old Marquee club). You can call yourself what you want, there is no law yet that can force you to be 'know as' someting different that's on your birth certificate. Good of you to take the time to introduce your passions and ways. As for doing the saem this end, I'll think about it, not too keen on the idea right now I must say. purely fro the point of it feeling like a chain letter. Thank you for the tag, I'll hop on it over the weekend. @ Martin: I know - I am pretty independent and tend to always do what I please anyway! @ Ivanhoe: That will be great - I would like to learn about you, one of my newest pals. Very interesting facts about you Emm. I find it gives more incentive to read your blog, since I feel I know you a bit better now, and only liking it more! @ Mireille: I am glad that you say that. I do find knowing a little bit about a person helps when it comes to reading their blog. @ Sheila: Our lives have been similar! My path was SA - UK - Nigeria - UK - SA - UK. @ Yazhi: Yay! Thanks for taking the time to catch up. I'm loving reading all about you again. As someone who grew up between two cultures, I can very much relate! Wow! i love the writing =) and the 7 facts about yourself ;) nice blog! Hi Jen, sorry for the late reply! Did you live in America all your life or did you also spend some time growing up in Austria? I like that I had such varied experiences! Hey Andrea, thank you! Do you also have a blog? Your profile s marked as private so I cannot see. @ Gena: Thank you! I think we often take on different personas when we blog so this was me connecting with the 'real me'! Lol, Emm, to think that I just decide to click your 'About Me' link and hey guess what I saw? Thanks! Will go think about the seven things about myself. Liking your blog Emm and thanks for leaving a comment on mine. By the way, for my "day job" I run a shipping company specialising in moving personal effects and vehicles to and from South Africa and Namibia. If you get fed up with our lovely weather and decide to head back South please keep me in mind! Hi Glen! Well, I don't have even a shade of a Scouse accent left unfortunately... We're not likely to move back to SA any time soon but I'll certainly keep you in mind! You have a great blog! Well, they use to call me Ice in high School because I was cold. I wasn't this way at all really, some boy in Spanish class just started calling me that when I said no to a date. glad that i know you better!